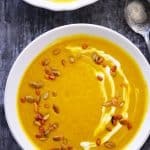 Butternut Squash Soup is a delicious way to eat more vegetables. 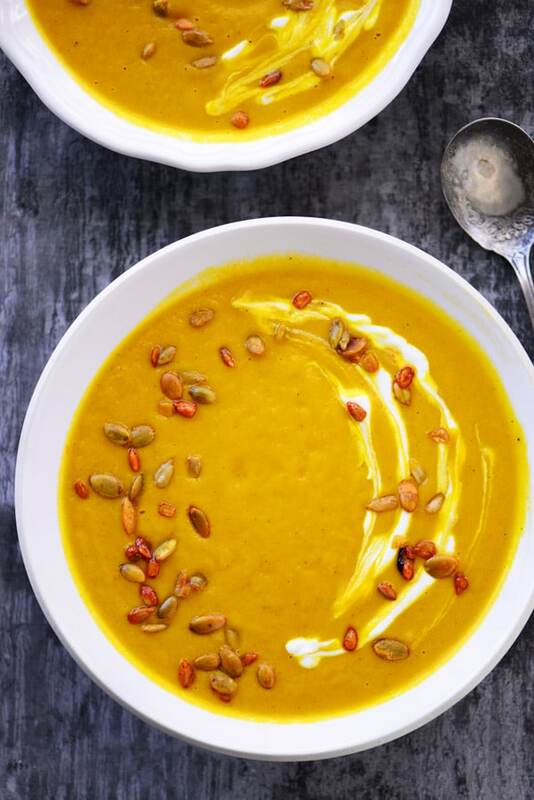 This healthy soup is full of flavor and is the perfect dinner on a cold night. With the new year comes all of the resolutions, many of which include dieting. I don’t like the word diet because it has a negative connotation of deprivation and hunger. I prefer to think of healthy eating as a positive. To think of it as adding in good foods. To eating more protein, vegetables and fruits and to drinking more water. 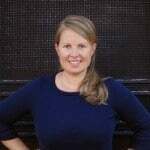 I try to focus on the benefits of how delicious the fresh foods are and how great I feel. One of the things I’ve been enjoying this week is this Butternut Squash Soup. 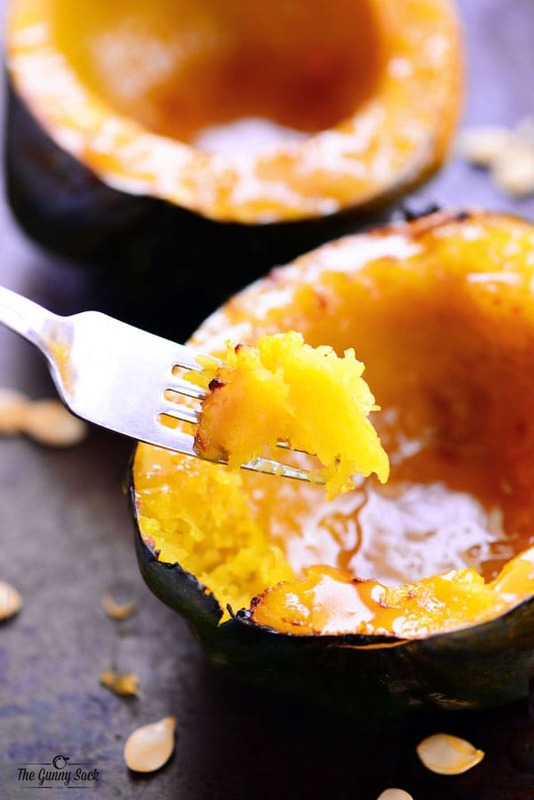 Cut a butternut squash in half and scoop out the seeds. Place both halves, cut side down in a microwave-safe dish and add a quarter inch of water to the dish. Cover with plastic wrap and cook in the microwave for 10-15 minutes or until it can be easily pierced with a fork. 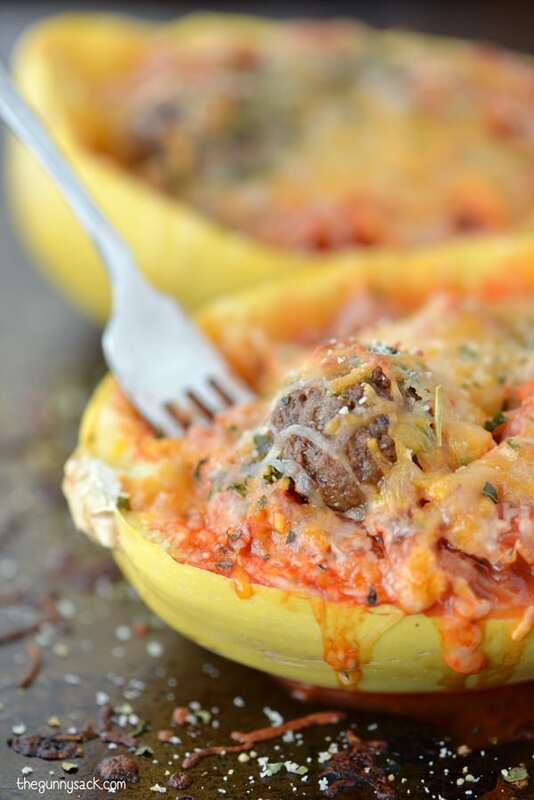 Scoop out the squash and set aside. Fry onions and garlic in butter in a large pot. 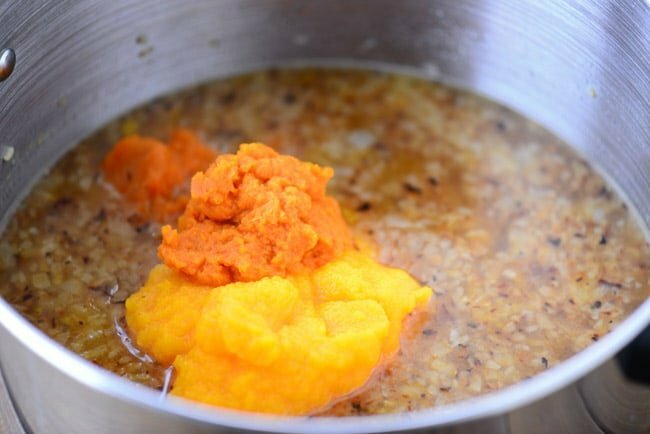 Stir in chicken broth, apple juice, butternut squash puree and pumpkin puree. Bring to a boil over medium heat, stirring occasionally. Turn the heat to low and simmer for 10 minutes, stirring often. Stir in nutmeg, pepper, and salt. 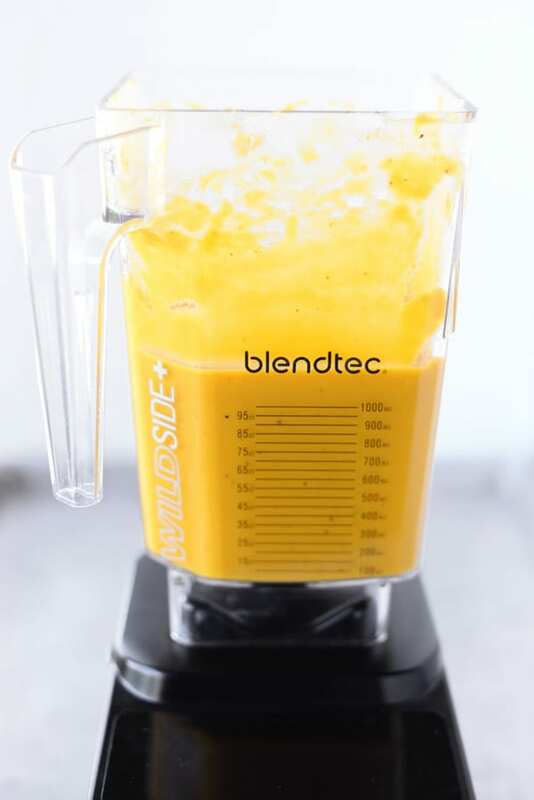 Carefully pour the butternut squash soup into a blender or food processor and blend until smooth. If yours isn’t large enough, you can do this step in batches. 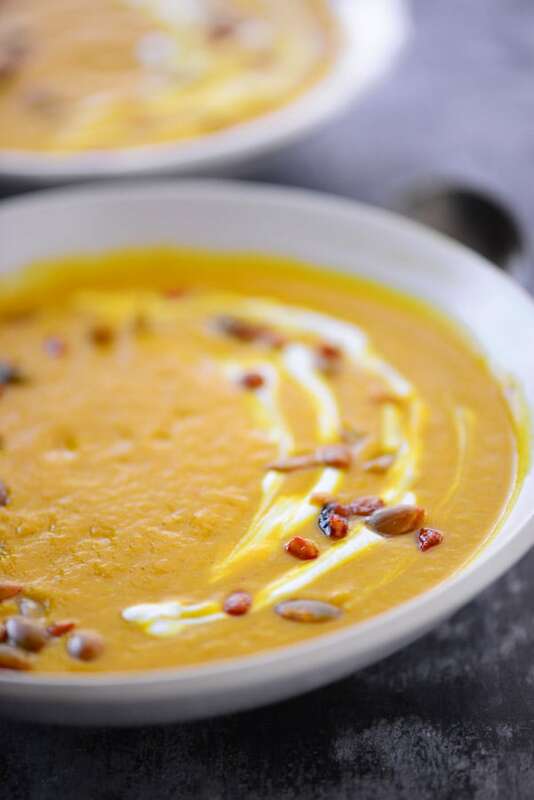 Garnish the buttenut squash soup with a sour cream swirl and sprinkle with roasted seeds. This soup freezes well! I like to store it in individual serving size containers so I can easily warm it up for lunch or dinner. Cut the butternut squash in half and scoop out the seeds. Place both halves, cut side down in a microwave-safe dish and add a quarter inch of water to the dish. Cover with plastic wrap and cook in the microwave for 10-15 minutes or until it can be easily pierced with a fork. 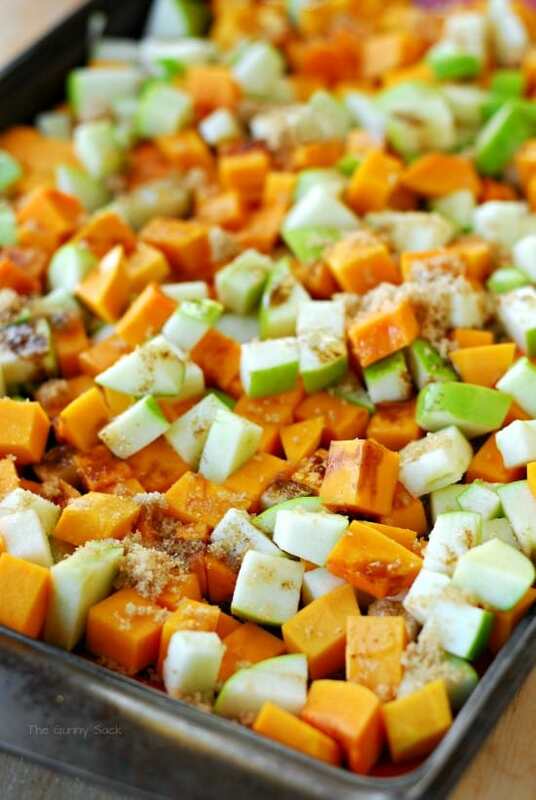 Scoop out the squash and set aside. Carefully pour the soup into a blender or food processor and blend until smooth. This step can be done in batches, if necessary. Garnish with sour cream and roasted seeds. Hi there! We have garden grown squash and j find it very hard to guess what size ‘medium’ is. Any idea on how many cups needed? How cool that you have your own squash! I wish I did. 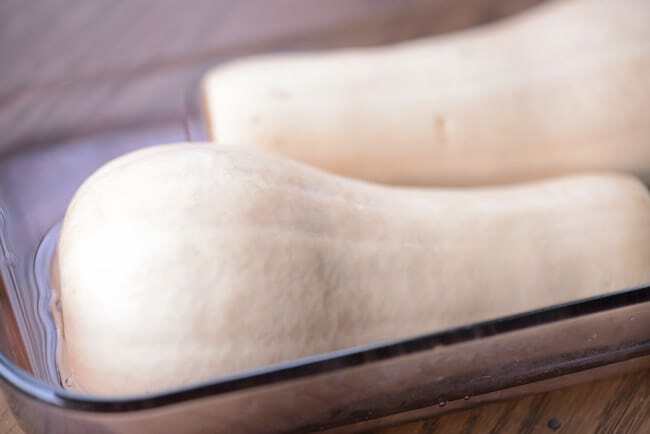 The recipe calls for two cups of butternut squash puree. Enjoy!